I have to begin today with two reminders. To regular readers of this column, you'll note that it is appearing on Thursdays and Tuesdays from now until the election, in a more abbreviated form. If Obama loses, then it'll probably continue on Tuesdays and Thursdays until next January, for completeness' sake. If Obama wins, this column will return to its prominent spot on the first possible Monday or Wednesday after the end of each month, and I'll likely have to come up with some better graphics after January. 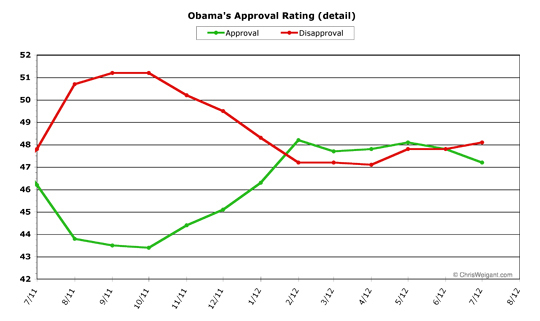 For everyone, a reminder that what we examine in this column is Barack Obama's job approval rating as president. This is only tangentially related to the 2012 election. Mitt Romney is not mentioned in this poll at all, it's a simple "Do you approve of the way the president is doing his job?" question. For the election itself, we have begun our Electoral Math column series, and we should be getting another one of these out some time next week, if all goes well. Barack Obama's worst time of year is the dog days of summer, and this year is proving no different. He had the worst month, overall, since last August, as his approval rate fell 0.6 percent to end the month at 47.2 percent average approval. His disapproval rate rose 0.3 percent, to end the month at 48.1 percent. 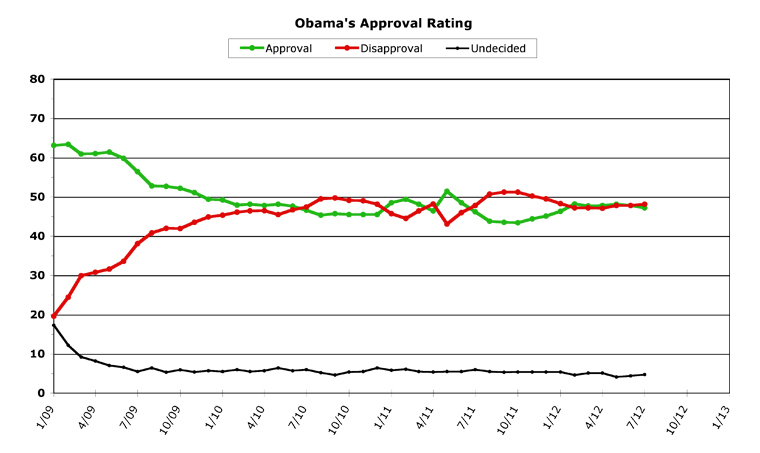 This put Obama almost a full point "underwater" -- for the first time since January. To put this into some perspective, however, Obama's net approval/disapproval rating changed 0.9 percent this month for the worse. But Obama's always had a tough time of it in the summer. 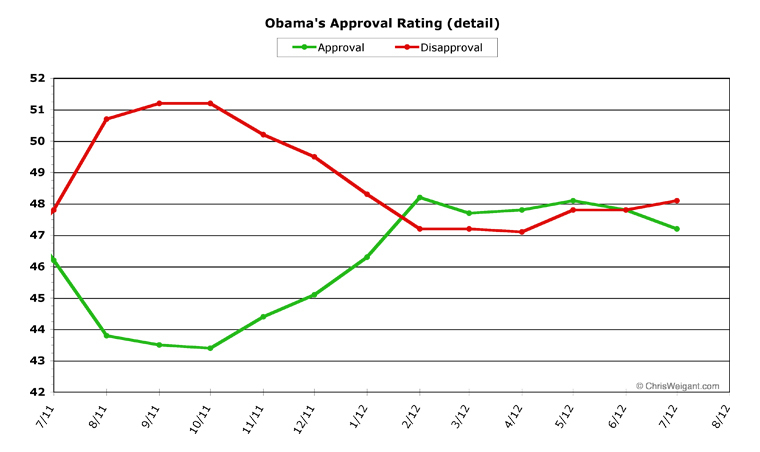 Last July, Obama lost a net of 4.1 percent (2.3 down on approval, 1.8 rise in disapproval). The July before that, Obama lost 1.7 percent, and in July of 2009 he lost a whopping 7.9 percent, as his initial "honeymoon" numbers fell back to Earth. Taken in comparison, Obama just had the best July he's ever had. That is not exactly a happy picture for the Obama campaign. No president wants to see a graph like that with less than 100 days to go before an election. Obama's daily trends throughout the month weren't much better. He never managed to get his approval rating above water all month, although at the end of the month he managed to tie disapproval at 47.5 percent for one day. Obama's approval rating was actually remarkably stable all month long, swinging only 1.1 percent during the entire month (tying a record for least-volatile month), but his disapproval numbers were slightly more active. Another thin reed of good news for Obama was that his disapproval numbers were on a pretty solid (if gentle) downward trend all month. This may help Obama as he enters August, but then again it may not. Why July's numbers were down for Obama is anyone's guess, really, but I'm going to pin a large part of it on the disappointing employment figures announced last month. Tomorrow's announcement of the numbers for July may do more to set the trend for August than any other single influencing factor. Historically, however, August has been even less kind to Obama than July. So we may see another drop in his numbers next month as well. This drop in job approval hasn't significantly bled over into the election polling yet, but another month of a downward trend may start showing up in the "Who are you going to vote for?" polls. We'll have to wait and see. Why July's numbers were down for Obama is anyone's guess, really, but I'm going to pin a large part of it on the disappointing employment figures announced last month. I'd say that's a safe bet, although one always has to wonder if the opponent's advertising, or O's "going negative," has anything to do with it. True, his average is 47%, but both Gallup's and Rasmussen's daily tracking have him at 45. I don't know if you've seen the last couple of polls, but I'll say again what I said before: With all the polling orgs out there, I'd love to know why they're not conducting clean surverys. "...Whoa there! This [Pew] poll is far, far out of line of other national surveys. Emily Schultheis at Politico writes that "the 10-point lead for Obama here is bigger than any of the other recent polling we've seen, which have tended to show a fairly static race." 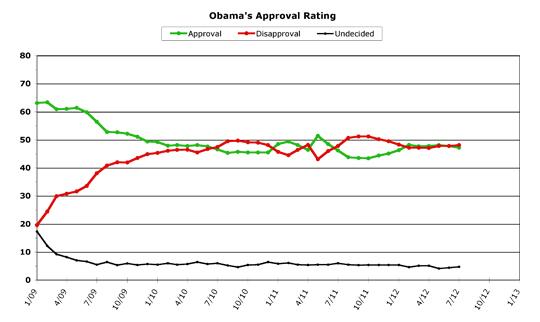 The Real Clear Politics' RCP Average of recent polls currently has Obama up by 3 points. In Talking Points Memo poll average, the divide is only 1.8 percent. Over at Business Insider, Brett LoGiurato is calling out the poll for bias: "Pew surveyed 1,956 registered voters. Of those, 42 percent were Democrats and just 23 percent were Republicans. We can't remember a poll being that imbalanced." How the heck is anybody supposed to know what's actually going on with voters out there? This reminds me of the Wisconsin recall, with everybody having convinced themselves that the race was gonna be squeaky-tight and that ballot counting might take until morning. And all this speculation had been based upon what turned out to be utterly faulty polling. And now here we are with Pew — a reputable polling org (or at least they used to be) — putting out a ridiculously over-sampled result. WHY they're even over-sampling, to begin with, is a whole other question. But I'd really love to know how much of the polling out there is even accurate and trustworthy these days. It doesn't excuse the likes of Pew's poll being so ridiculously over the top, though. "If you have a business, you didn't build that!" How ironic that those words will likely become the defining aspect of the Obama Presidency.. I have a response to that..
Is everyone sobbing in their Cheerios??? "Brian!! Look!!!! My Alpha Bets are talking to me!!! They're saying 'OOOOOOOoooooooooo' "
Did you see the White House's attempt to spin it? Does Team Obama SERIOUSLY think anyone but their base will buy that!??? Mainstream Media Blacks Out Chick-fil-A Story? And, of course, the vandalism committed by the allegedly "tolerant" group goes unreported.. The hypocrisy is so thick you can cut it with a knife..